Anyone with an Internet connection will have heard (for about two years!) how Virtual Reality (VR) is ‘the next big thing’. But aside from playing games, the applications of VR are still somewhat limited, especially when it comes to the healthcare sector. The idea of putting on a headset and travelling to new worlds did, however, grab our attention and we began to explore how VR could support pain/anxiety/stress management within a healthcare institution setting. Through our relationship with a number of doctors and health boards built over 10 years by our parent company, the All Wales Adult Cystic Fibrosis Centre contacted us to understand if we could support developing the right technology platform to combat Pain, Anxiety and Stress Management for their patients. This was the partnership we needed to get moving. It was a group of Cystic Fibrosis patient that we began to work with first. Due to that condition, patients are often treated in isolation, due to the threat of infection, where they can experience anxiety, breathlessness and pain. We wanted a solution that was simple and straightforward to deliver for healthcare professionals with little or no experience in VR. VR can be complicated and difficult to use if you have little or no experience, and we knew this would be a barrier to both patients and healthcare professionals. As such, we developed a closed system where the VR headset and the experiences were all controlled by a tablet. All the experiences were held on the device to ensure they could be used in any location in the hospital – no Wi-Fi was required. This was a HUGE breakthrough for the project, freeing us from attempting to control things that were highly likely to create issues. Disabling the functions on the VR headset and allowing the healthcare professional to control the entire experience through a tablet, ensured the healthcare professional could moderate the content shown and made it easy and simple to implement. The system was so simple the staff did not require any training outside from the initial demonstration, and they were able to demonstrate immediately to other colleagues. The VR delivery was through the Samsung Gear VR headset, a hard-plastic headset which is able to be wiped down and disinfected (many VR headsets are not suitable for a healthcare setting due to the materials used). We also provided VR Sanitary Masks to adhere to infection control guidelines and also to ensure no irritation for the patients. In addition to utilising the tablet to control the experiences, the device also collated data. The doctors wanted to be able to collate the patient’s anxiety/stress level pre and post VR experience and store the data effectively. We developed two apps – one for the tablet and one for the VR device and connected them to allow the transfer of data and to be able to access the data in real time in a simple and straightforward process. The table led the healthcare professional through the process to ensure operational simplicity. We created 6 experiences to cover a wide demographic and were all produced in 4K with a static 360 camera. This ensured motion sickness would not be a factor but also ensured a closed system where only these experiences could be viewed. Each experience was 7.5mins in duration and we heightened the engagement by creating documentary style experiences engaging the patient so they felt like a participant in the experience and not just a viewer. By developing a closed system it ensured the content was able to be monitored and no approved content could be viewed. For example, immersing Beryl (80 years old) in a high adrenaline rollercoaster experience would give very adverse effects to managing her stress and anxiety! 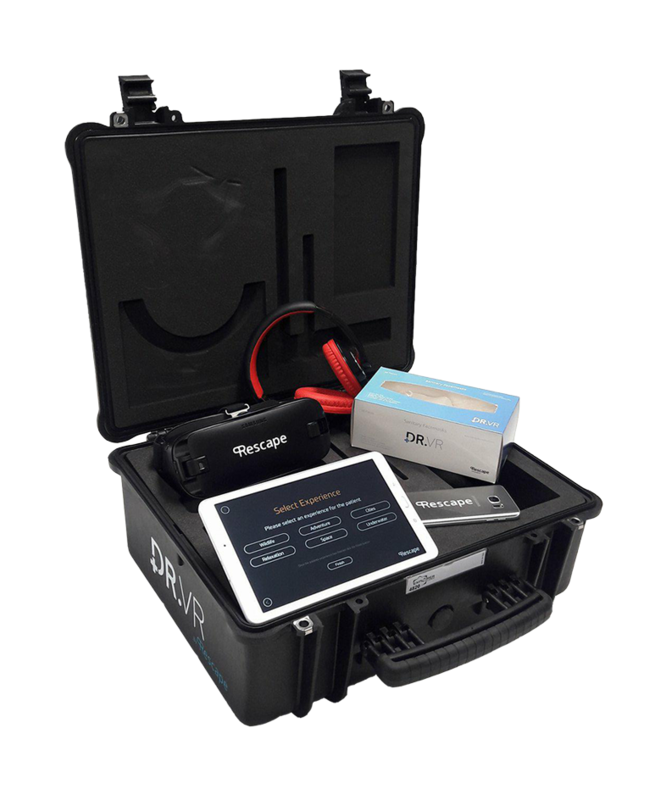 Everything required to deliver a patient VR experience and is all controlled by the healthcare professional through a tablet. The tablet allows each healthcare professional to gather data on the effectiveness of the experience and access data from all of the DR.VR solutions to effectively choose the right experience. Each of the documentary style experiences have been created to offer your patients an escape from their reality. Each documentary is filmed in high quality (4K), 360 degrees from a static point, reducing the chance of patients suffering from motion sickness. Patients can travel around the cities of the world, swim under the oceans, come face to face with the animal kingdom and relax in some of the most beautiful settings in the world all from the healthcare institution. DR.VR also contain two experiences for the more adventurous patient where they can travel among the planets in the solar system or experience surfing, skydiving and other adrenaline fuelled activities. The trials were conducted with patients (aged between 17-54 years old) who were experiencing a high level of stress and anxiety. Pre VR experience: 49% were slightly anxious; 25% fairly; 16% very and 10% extremely anxious. Post VR experience: 50% displayed zero levels of anxiety and stress. Overall there was a 64.8% improvement of anxiety and stress. Pre VR experience: 61% slightly; 35% fairly and 4% very anxious. Post VR experience: 91.4% displayed zero levels of anxiety. Pre VR experience: 34% slightly; 22% fairly; 22% very and 22% extremely anxious. Post VR experience: There was a 100% improvement for all participants and all participants displaying extreme levels of anxiety pre VR experience reduced to none, slightly or fairly. Both patients and staff found VR acceptable and easy to use, and as can be seen, the results were astonishing! 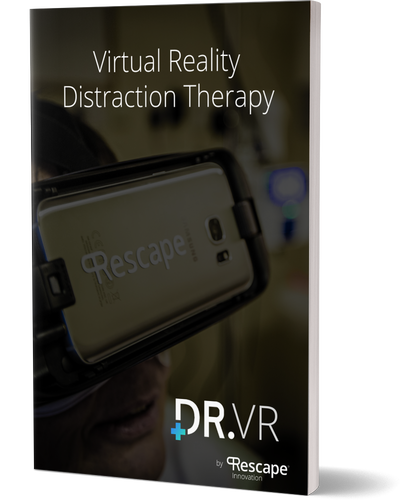 There was a major decrease in symptoms of anxiety post VR distraction therapy experience noted in the majority of patients – up to an average reduction of 75% in patient’s anxiety! “We contacted Rescape to understand how Virtual Reality could help patient care. Cystic Fibrosis is an inherited condition that demands a number of treatments and procedures which can be very uncomfortable for the patients. Stress and anxiety is a big factor for patients. Patients and staff have never experienced VR before and Rescape were able to come and meet us, talk through the process and make the whole experience simple and straight forward. It has been very well received by both patients and staff alike and we are now working with Rescape to create different experiences. 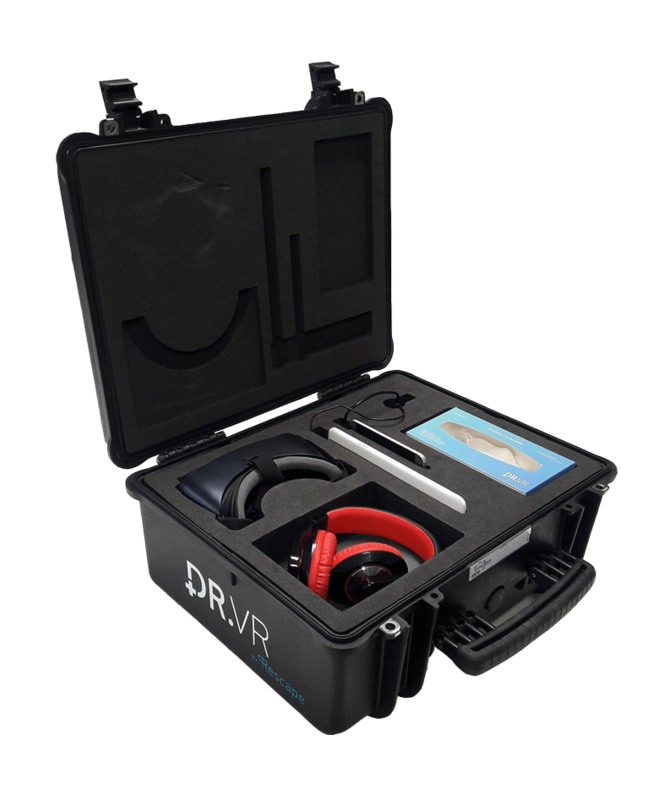 Simply fill in the form below for instant access to our DR VR brochure.